ZOOM Hosting Review 2019: Is ZOOM Hosting a Good Hosting? ZOOM Hosting is an excellent choice for beginners and websites that don't need a lot of advanced features. Their Enterprise plans are reliable alternatives to business hosts such as Weebly or Wix. 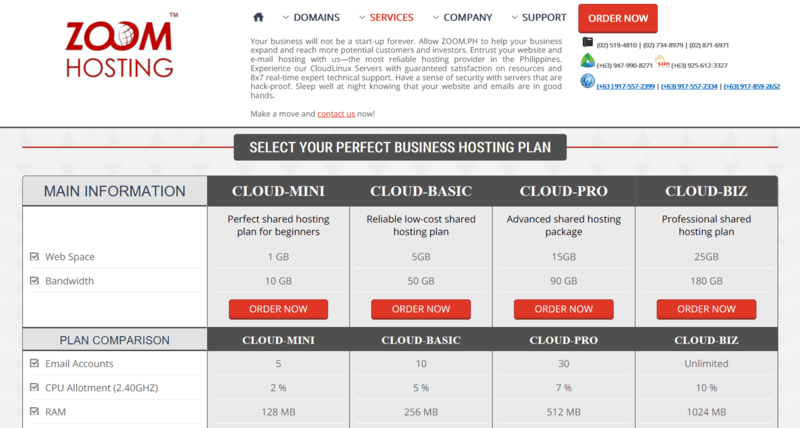 ZOOM Hosting has been offering website hosting services to the Philippines and beyond since 2009. While they specialize in serving small and medium-sized businesses, they seem to lack many advanced features that some websites will need. Personal and small business websites will be fine with this platform, but if you need advanced developer support, you’ll need to look elsewhere. Outside of offering support for phpMyAdmin and offering MagicSpam anti-spam, they don’t offer much in the way of value-added features. They don’t even provide free SSL certificates or free domains with their plans. Now, if you’re looking for a basic website or are a beginner looking for a website host that’s easy to use, this is one you can consider. They offer the simple-to-use SiteHaven website builder along with the Softaculous auto-installer with hundreds of apps, including WordPress, Joomla, Drupal, Coppermine, Zen Cart, and more. Otherwise, you can use cPanel to upload your files and build your website. The Cloud-Mini and Cloud-Basic are adequate for single domains, but they’re a bit light on storage for anything more. Cloud-Pro and Cloud-Biz are your best options, but I’d like to see more storage on Cloud-Biz. Of course, if you want unlimited storage and bandwidth, you can opt for their Unlimited Cloud Hosting plans. However, these offer some severe limitations that you should be aware of. Specifically, the plans only support one to five MySQL databases, and the RAM on the plans is lacking. Due to this, I don’t recommend even considering their Unlimited plans. These are much better plans, and perfect for businesses websites that require extensive database support. ZOOM Hosting’s Business Cloud and Unlimited Cloud plans are a bit cheaper than similar offerings from the average web hosting company, though I wouldn’t even bother with Unlimited Cloud because of the limitations on plans. The Enterprise Cloud plans are pricier, but you’re also getting business-grade hosting. Compared to other hosts such as Shopify, Weebly, and Wix, pricing is either on par or slightly higher. Regarding support, ZOOM Hosting offers average support at best. They only provide telephone, ticketing, and online contact form support. They don’t offer live chat support. Their knowledge base is also somewhat average compared to other hosts. ZOOM Hosting is suitable for most websites that don’t need advanced developer support such as Python or Ruby. However, stay away from the “Unlimited” plans since they have limitations compared to Business and Enterprise plans. Wondering how ZOOM Hosting stacks up against other Web Hosting companies? Enter any other Web Hosting company and we will give you a side-by-side comparison.